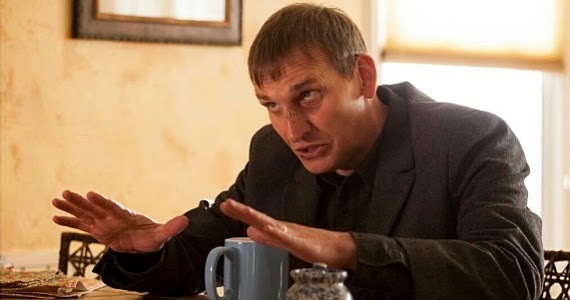 In the lead-up to the series premiere, critics with screeners all raved about “Two Boats and a Helicopter,” which focuses exclusively on Christopher Eccleston’s Father Matt Jamison. I had high hopes for this episode, particularly since its placement third in the first season evoked Lost’s “Walkabout,” which many people cite as the a-ha moment in their Lost-watching journey. And “Two Boats and a Helicopter” was an excellent episode. Its emphasis on faith, the Abrahamic notion of the test and the sacrifice, the way we view luck as divine mercy or devilish irony, are all right up my alley. Eccleston aced it. Even the dream sequence wasn’t awful, and I have very little patience for dream sequences. However, “Two Boats and a Helicopter” has me wondering if maybe this is a good time to bow out of The Leftovers. The pilot was a dreary portrait of Justin Theroux’s Kevin Garvey. The second episode, which focused on Liv Tyler’s Meg Abbott, was excellently constructed—but the construction (the tree is a symbol! Objective correlation!) felt by-the-numbers. “Two Boats…” may be the best of the batch, but it’s also the third character-centric episode in a row. Is that what this show will do? Provide a little short-story narrative each week, giving us a Peyton Place-meets-the-Apocalypse person-by-person portrait of existential angst? That could be a thing, but I’m not sure it’s my thing. What are your thoughts? In the comments on the pilot episode, a few people mentioned sticking around for this episode. Do you think you’ll stick with the show for the rest of the season? To say that this is the best one yet is an understatement on a grand level. It's something new. Something better. So far, this series is shaping up to be one of the great ones. However, this episode almost demands that the quality bar be rose. I don't know what Lindelof, Perrotta, and the writers have in store for us next but I can't imagine it coming close to quality like this, though I'd love to be proved wrong. I predict that when all is said and done, whether the show lasts one season or five, that we will all look back on this episode as one of the series high-points. You compared this episode to the great "Lost" episode "Walkabout". The comparison is earned! Both take a supporting character and shine the spotlight on them so bright that they threaten to overshadow everyone and everything else we've seen. I hope that's not the case, since I'm still extremely curious about the other plots the writers have been setting up. When it comes down to it I just hope they have something worthy at the end. Otherwise, to quote Matt, "all of our suffering will be meaningless." I LOVED the Pilot episode and thought the second was great as well. I really hope you continue to review this series or find someone else to do so. I love Billy's site and everyone's reviews and I was really looking forward to reading some thoughts on the second outing. I loved Eccleston in this, his accent kinda threw me but he sounds like a credible American. Unlike Anthony Head who sounds bizarre as a non-brit in Dominion. The bleakness of the episode worked for Eccelston's skill at portraying inner turmoil. That said, I think I'm out now. The show is just not for me. I don't mind slowness, but I get no sense that there's a journey that's worth taking. I just saw the fourth episode and it just keeps getting better and better. For me it's some of the best TV out there. No steady reviewing is going on! Sure, the show had a difficult start (mysteries, character building), but since then has picked up the pace and it is the only weekly show I'm watching now. The gloomy, mysterious vibe keeps me coming back. I won't be reviewing The Leftovers. I haven't officially quit it, but I've been letting the episodes pile up on my DVR. I don't think it's the show for me.